Presented by AOL, Seven on Seven 2011 took place on May 14th at the New Museum. It was organized by Lauren Cornell. 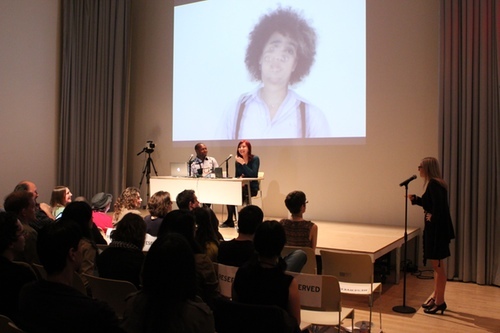 Read the liveblog and Hyperallergic on the whole event. Lauren Cornell is the Director of the Graduate Program and Chief Curator at CCS Bard. Formerly she was the Curator and Associate Director of Technology Initiatives at the New Museum. She curated the 2015 New Museum Triennial, Surround Audience, with artist Ryan Trecartin, as well as Beatriz Santiago Munoz: Song, Strategy, Sign, with Johanna Burton and Sara O’Keeffe (2016); Walking, Drifting, Dragging (2013); Free (2010); and Younger than Jesus, with Massimiliano Gioni and Laura Hoptman (2009), among other exhibitions. At the New Museum, Cornell has organized over fifty performances, screenings, and conversations and commissioned over one hundred works in a variety of mediums, including sculpture, painting, photography, installation, and video, as well as browser-based work and virtual reality. In 2010, she founded the annual conference Seven on Seven and, in 2016, she cofounded Open Score, an annual forum exploring issues in art and technology. From 2005–2012, she served as executive director of Rhizome, an organization that commissions, exhibits, and preserves art engaged with technology. From 2002–2004, she served as executive director of Ocularis, a now-closed cinema in Brooklyn. Caterina Fake is an American entrepreneur and businesswoman. She co-founded the photo-sharing website Flickr, which was sold to Yahoo!, and Hunch, which was sold to eBay. She is a founder partner at Founder Collective, an active angel investor, and has invested in Etsy, Kickstarter, Stack Overflow, and 20×200. Currently she is the founder and CEO of Findery and chairman of the board at Etsy.com. Michael Bell-Smith is a contemporary artist who lives and works in Brooklyn, New York. Bell-Smith's work utilizes digital forms to explore the use of popular technologies in contemporary visual culture. Bell-Smith received a Bachelor of Arts degree in Semiotics from Brown University in 2001. His work has been exhibited internationally, including The New Museum, New York; Foxy Production, New York; Hirshhorn Museum and Sculpture Garden, Washington, D.C.; The Museum of Modern Art, New York; Roslyn Oxley9 Gallery, Sydney, Australia; LISTE, Basel, Switzerland; Galeri F15, Moss, Norway; Threshold Artspace, Perth, Scotland; The Museum of Fine Arts, Lausanne, Switzerland; Vilma Gold, London; BankART, Yokohama, Japan; Glassbox, Paris; PROJEKT 0047, Berlin; and Tate Liverpool, Liverpool, UK. Bell-Smith was an Eyebeam resident in 2002. Andy Baio is an American technologist and blogger. He is the co-founder of the XOXO Festival, founder of Upcoming.org, a former CTO of Kickstarter and the author of the Waxy.org blog. Emily Roysdon is an artist and writer. Her working method is interdisciplinary and recent projects take the form of performance, photographic installations, printmaking, text, video, curating and collaborating. She is editor and co-founder of the queer feminist journal and artist collective, LTTR. Her many collaborations include lyric writing for The Knife, and JD Samson & MEN; costume design for choreographers Levi Gonzalez, Vanessa Anspaugh and Faye Driscoll; and performance in Boris Charmatz's Expo Zero. Roysdon developed the concept "ecstatic resistance" to talk about the impossible and imaginary in politics. The concept debuted with simultaneous exhibitions that Roysdon curated at Grand Arts in Kansas City and X Initiative in New York. The essay has been translated into Spanish, German, Czech, and Maori languages. Kellan Elliott-McCrea, until recently served as the CTO of Etsy, where he grew and led the Etsy engineering organisation for five years. He helped pioneer and popularise innovative engineering including new approaches continuous deployment, metrics, just culture, and inclusion. During his tenure Etsy grew to a $1+ billion dollar publicly traded B-corporation. He also played a critical role in the the company’s restructuring of its engineering organisation, in an effort to add diversity to the engineering staff, particularly, gender diversity. Previously he spent 5 years as part of the early Flickr team as Architect, where he helped guide the site’s explosive growth. Liz Magic Laser lives and works in New York. Her practice includes video and performance as well as sculpture and installation. Dissecting ideas of power and how it is performed, Laser has worked with such forms as presidential speeches, TED Talks, and nightly news broadcasts. She often integrates audience participation into works that involve social and political critiques and has staged performances in public spaces such as banks and movie theaters; these projects were influenced in part by Bertolt Brecht’s concept of epic theater and Augusto Boal’s theater of the oppressed. More recently, Laser has expanded her interest in the construction of identities to include children and the ways in which their self-perception is influenced by the news media. Ben Cerveny is co-founder and President of Bloom Studios. He has worked for over 20 years on user interaction and experience design, concept prototyping, and strategy in the context of media applications, operating systems, web services, ubiquitous computing, and massively multiplayer games. Most recently, he was an advisor and strategist at Stamen Design, a leading visualization design studio. Previously, he was the founder of the Experience Design Lab at frogdesign, an international product design company, and a lead game designer and platform development strategist at Ludicorp, makers of Flickr. He is also the founder of the Amsterdam-based research foundation VURB, which investigates digital urbanism, and is constantly engaged in the investigation of innovative ways to improve the flow and play of a user's relationship with task or information. Zach Lieberman is an artist with a simple goal: he wants you surprised. His work uses technology in a playful way to break down the fragile boundary between the visible and the invisible. He has held residencies at Ars Electronica Futurelab, Eyebeam, Dance Theater Workshop, and the Hangar Center for the Arts in Barcelona, and his work has been exhibited around the world. Lieberman is one of the co-founders of openFrameworks, a C++ library for creative coding. He’s currently working on the EyeWriter project, a low-cost, open source hardware and software toolkit that helps people draw with their eyes. The project has won the Design of the Year from the London Design Museum, FutureEverything prize and the Golden Nica in Interactive Art at Ars Electronica. It was also listed by Time Magazine as one the 50 best inventions in 2010. Bre Pettis is a co-founder and former CEO of MakerBot Industries, a company that produces 3D printers now owned by Stratasys. Besides being a TV host and Video Podcast producer, he has created new media for Etsy.com, hosted Make: Magazine's Weekend Projects podcast, and has been a schoolteacher, artist, and puppeteer. He was the artist-in-residence of art group monochrom at Museumsquartier Vienna in 2007. Rashaad Newsome is a multidisciplinary artist whose work blends several practices together, including collage, sculpture, video, music, computer programming, and performance. Best known for his visually stunning collages housed in custom frames, Newsome’s work is deeply invested in how images used in media and popular culture communicate distorted notions of power. Using the equalizing force of sampling, he crafts compositions that surprise in their associative potential and walk the tightrope between intersectionality, social practice, and abstraction. Jeri Ellsworth is an American entrepreneur and autodidact computer chip designer and inventor. She became known in 2004 for creating a complete Commodore 64 system on a chip housed within a joystick, called C64 Direct-to-TV. That "computer in a joystick" could run 30 video games from the early 1980s, and at its peak sold over 70,000 units in a single day via the QVC shopping channel. Ellsworth co-founded Technical Illusions in 2013, which was later renamed CastAR. Camille Utterback is an internationally acclaimed artist and pioneer in the field of digital and interactive art. Utterback’s work explores the aesthetic and experiential possibilities of linking computational systems to human movement and physicality in visually layered ways. Her work focuses attention on the continued relevance and richness of the body in our increasingly mediated world. To create her projects, Utterback combines various sensing and display technologies with the custom software she writes. Whether expressed in the form of architectural-scale projections, custom LED lighting, or intimate sculptures with embedded LCD screens, Utterback’s work engages participants in a process of embodied discovery as they explore the possibilities and behaviors of her physically engaged systems. She currently lives and works in San Francisco. Erica Sadun enjoys deep diving into technology and has written, co-written, and contributed to dozens of books about computing and digital media. Sadun has blogged at TUAW, Ars Technica, O'Reilly, and Lifehacker, and has (to date) authored or co-authored more Swift proposals than anyone, including everyone on Apple's Core Team. Ricardo Cabello is a self-taught computer-graphics programmer. Originally from Barcelona, Cabello began his professional career alternating between roles as a designer and developer. In his spare time, his involvement in the demoscene set him on the path to learning graphics programming. Combining his background as a designer and expertise in development, his work ranges from simple interactive digital toys — Google Gravity, Ball Pool, and Harmony — to full-featured experiences — The Johnny Cash Project, The Wilderness Downtown, and ROME. Nowadays, Cabello spends most of his time developing open source libraries and tools — three.js, frame.js and stats.js — with the aim of making design and development simpler for everyone. Chris Poole is an American entrepreneur. He is best known for founding two websites, 4chan and Canvas Networks. He started 4chan pseudonymously, under the screen name moot.